Ozenbaugh, EMI Filter Design, 2nd ed. 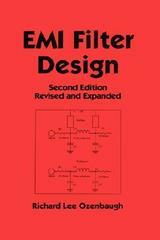 EMI Filter Design, 2nd ed. READERSHIP: Electrical and electronics, power supply design, systems, and radio and telecommunications engineers, and upper-level undergraduate and graduate students in these disciplines. What will compromise the filter?